Amtrak and Chicago city officials yesterday announced a team led by Riverside Investment & Development Co. will be the master developer for the $1 billion project to redevelop Union Station and the surrounding area. The proposed commercial development will total 3.1 million square feet at full buildout and include new office towers, a hotel and office and residential space. Riverside proposed the initial conceptual design in conjunction with co-developer and co-venture partner Convexity Properties — a DRW Co., according to an Amtrak press release. The three-phase project is expected to be completed in about six years. Key project priorities include improved street entrances and pedestrian traffic flow into and out of Union Station, as well as improved landscaping and open space. "This building was envisioned by Daniel Burnham in the 1909 Plan for Chicago as the city's primary rail station. It is in that spirit, we have big plans for both this Headhouse building and nearby properties owned by Amtrak," said Amtrak President and Chief Executive Officer Wick Moorman. "We have initiated real estate developments such as this to create revenue streams to invest in our core business, to improve facilities, to provide amenities to all users of the station — and to attract new ones. We are certain we will do that here in Chicago." Amtrak's board this week approved the designation of the master development team led by Riverside. The vote followed staff recommendations made after a technical and financial review assisted by KPMG, AECOM and Savills Studley. The board also approved finalizing financial negotiations with Riverside by the end of the year. Phase I of the project will consist of the Union Station Headhouse and concourse improvements, including 110,000 square feet of new and reconfigured retail with a new food hall; street level retail; renovation of the Headhouse and Great Hall; 100,000 square feet of office space and a new hotel above the Great Hall; and two new 12-story residential towers above the Headhouse. Phase II will consist of new office towers with retail and parking. Included in that part of the project will be two new 750,000-square-foot office towers with with ground-floor retail and 800 parking spaces; and publicly accessible green spaces featuring terraces and plazas, with three above the existing Union Station Transit Center. Phase III will involve construction of a 500,000 square-foot retail and residential tower developed over active rail lines with open space and plazas at street level. "Adapting such an iconic building and transportation hub that serves so many is a responsibility we take very seriously," said John O'Donnell, CEO of Riverside. "This will be a transformative project for the West Loop and the city." 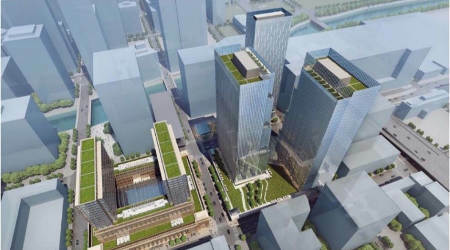 Commercial aspects of the project do not require federal, state or local funding and are subject to consideration and revision by Chicago's Plan Commission, Landmark Commission, Zoning Committee and City Council, city officials said. "This agreement will generate thousands of jobs and ensure a more vibrant future for Union Station and the entire city of Chicago," Mayor Rahm Emanuel said. "The thorough planning process with Amtrak and the many partners involved in this historic endeavor will ensure this plan generates the greatest economic impact and benefit the entire region and nation."